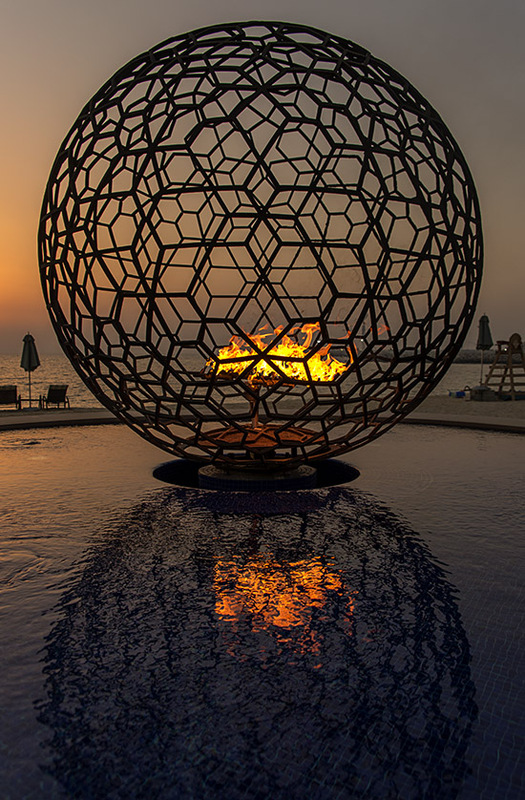 As I watched the Dubai sun set into its murky haze, never quite reaching the horizon due to dust suspended in the Middle Eastern air, our hotel had lit a fire in this hexagonal hollow globe, allowing the light of the flames to reflect into the darkening pool on the shore line. I was drawn back to this poem by Robert Frost, and my childhood wonder of looking into the dying embers of a fire, once hissing and sparking as the damp limbs of the log, newly gathered in from the cold winter pile outside, spat new sap into the flames, only for it to burn up and gradually shrink to nothing. As a pre-school child in a northern winter, those were such special moments. The light outside would fade away and far from being a time of fear or anguish, the dying embers were comforting, secure, food for infinite imagination; patterns that were as varied as they were exciting. But in adulthood the religions of the world infuse in us that fire is the place of all hell, with brimstone and eternal pain if we do not “follow the way.” At some point ice and cold is offered as another place of hell -never ending chill and hopelessness. Two beautiful parts of nature’s expression turned into something to fear and avoid. The great American poet Robert Frost had a wonderful way of distilling life down to some real truths, along with enough humour to bring us back to sanity and somewhere comfortable. For me the fire of new night is the place of warmth, comfort, love and passion. How sad that for so many it should be anything else. The Ireland of my childhood was one where our ‘daily’, a 1950’s refugee from Irish poverty, stuck in a tenement building in North London with just three rooms, yet housing her eight children, her husband and herself, was infused in the fear of eternal hell-fire and damnation if she interfered with the natural way of her God. So those children just kept coming, because she feared for the alternative. Today, by contrast Irish people have voted for gay marriage, for equal rights in the eyes of the law of their land, giving hope for a world where people can just be people, free from dogma, fear, persecution, allowing love and respect. Those are the fires that I wish had burned for that poor woman and her family too – hope, love, warmth and comfort. Words and picture:© Copyright John Swainston, 2015Poem: Robert Frost. Fine sentiments and fine writing, John. The Irish decision brings hope; and I’m comforted that the four tonne of firewood I had delivered before I left is keeping my family warm in Hobart; and the fire that I gazed into in Arnhem Land a couple of nights ago helped keep the mosquitoes at bay. Always loved that poem…look forward to your next post. John I have just come home from the sydney launch of my husband Robert Adamson’s new volume of poems Net Neddle published by Black Inc in Australia , Flood Editions in USA. Opening the field of your new blog , I see photography and poetry – in powerful combination. Your texts takes me back to fire embers around the campsite in a Fringe Camp in Central Australia in 1970 or in the grate of a communal terrace house in London 1965. I too have always been comforted by those warm embers. Ireland is luminous tonight for supporting Love – and freedom in it. Bravo Ireland we thank you. Look forward to your next posts.